General Motors cut the starting price of the plug-in hybrid sedan by $5,000 to compete against the less-expensive and better-selling Toyota Prius and Nissan Leaf. 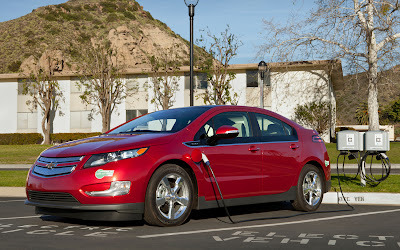 The 2014 Volt, arriving in U.S. dealerships later this month, will start at $34,995, the Detroit-based automaker said today in an e-mailed statement. The price cut comes, in part, to make sure the Volt shows up in online shopping searches along with the Prius and Leaf, which start, respectively, at $25,010 and $29,650, including destination fees, GM said. The model, which is eligible for a $7,500 U.S. tax credit, was introduced in 2010. Volt is GM’s flagship car for its efforts to have about 500,000 vehicles on the road by 2017 with some form of electrification. The car can travel 38 miles (61 kilometers) on battery power before a gasoline engine engages. While Volt sales rose 9.2 percent through July, deliveries slipped 3.3 percent last month. That followed a 53 percent gain in June when the average cost of incentives per Volt was $6,195, according to Edmunds, citing the most recent month with available data. Leaf sales accelerated this year after Nissan in January added an S version of the Leaf that’s cheaper than the SV and SL models. Unlike the Volt, the Leaf has no extended range engine. Leaf sales more than tripled to 11,703 through July from 3,543 during the same period a year earlier, outselling Volt in the U.S. by 60 vehicles. Toyota’s Prius is the most frequently traded-in vehicle for a Volt, GM said in the statement. U.S. sales of the Prius were little changed through July with 143,508 deliveries. Those results include sales of a plug-in version of the Prius, which saw deliveries slip 8.3 percent, according to researcher Autodata Corp. The plug-in Prius starts at $32,810. Toyota also sells a subcompact Prius c that sells for $19,890.